ne day I was speeding along at the typewriter, and my daughter - who was a child at the time - asked me, "Daddy, why are you writing so fast?" And I replied, "Because I want to see how the story turns out!" 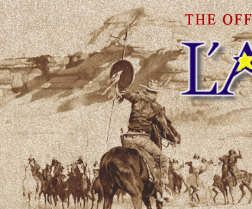 It is with this same sense of adventure, excitement, and anticipation that we are proud to welcome you to the official Louis L'Amour web site. The What's New page will give you an indication of all the latest products and services that appear on the web site. Whether you are new to the thrilling frontier fiction of Louis L'Amour or are one of his millions of die-hard fans, here you'll get the most indepth and personal look at the man and his work. We also offer articles and exclusive materials not available anywhere else including a biographical profile of Louis by his son, Beau L'Amour. ORDER NOW IN HARD COVER! We'd also like to invite you to take part and help us build this community by expressing your views in the discussion forum or signing the guest book. To see if perhaps you or someone you know is a part of the Louis L'Amour's history click on the Biography Project . Visit The Louis L'Amour Trading Post and complete your collection or start a new one. 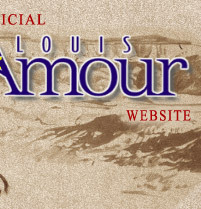 We've got all of Louis' non-fiction, novels and short stories, the exciting dramatized and complete unabridged audio tapes, high quality clothing branded with the Louis L'Amour logo and much, much more! Find all the Lost Treasures Titles HERE! Read true tales of the Civil War, Indian Wars, westward expansion, and more!